Docebo allows you to create and manage courses, as well as categorize them quickly and easily. By using a single interface, you can create courses, change course layouts, upload and manage course materials, configure advanced course settings, and much more. This manual will show you how to use all of the functions within the Docebo Courses area. Begin by accessing the Admin menu from the left sidebar (the gears icon). Then, press the Courses item from the E-Learning section. Add learning materials to your courses. Configure the advanced settings of courses. You will find an action bar at the top of the page that allows you to perform different functions in this area. Directly below the action bar, you will also see a search bar that allows you to search for specific courses on this page as well as filter which courses you see in the list. Below, there is a section displaying the branches that organize the courses. You can click on the folder icon next to the branch name to view the courses in that branch. Finally, you will see a list of courses that you have created. Let’s discover how to navigate this interface. To begin, click the New Course button in the action bar on the top of the main Courses page. In the pop up box, add the course name and choose a thumbnail. You can also insert a course description to let users understand what they are going to learn, as well as a course code. When you’re finished, press Confirm. The course you have created will now appear in the courses list on the bottom half of this page. From here, you can begin managing your new course. In the course’s row, click the Enroll button to start enrolling users. Please follow the link in this paragraph to learn the process for enrolling users to courses. The second step in creating your courses is setting the advanced options. In the Docebo Course Management Area, you have an Advanced Settings section that allows you to manage these options. Click the highlighted icon on the right side of the course you would like to edit, then choose the Advanced Settings option. Please refer to this manual to learn aboutconfiguring the advanced settings of a course. Once you have created your course, you can start adding training resources prior to enrolling students. Click the highlighted icon on the right side of the course, and choose the Training Material option. You will be redirected to the Training Material area for this course. 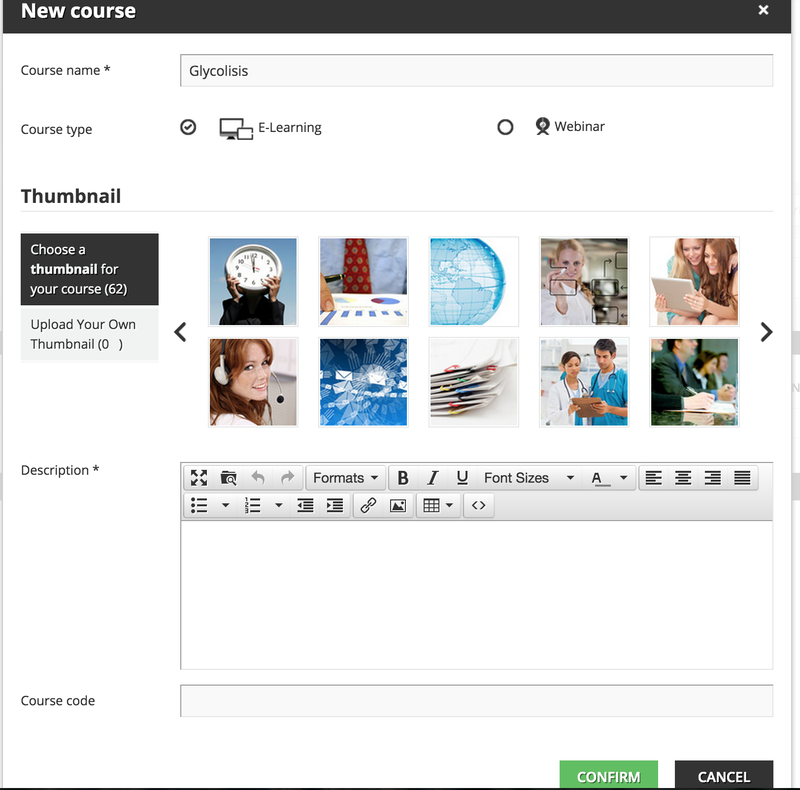 Here, you will be able to add and manage Learning Objects and organize course layouts. To add a new Learning Object, click the Add Training Material button, and choose which kind of Learning Object you would like to upload. You can also organize Training Resources into folders. Folder. These are used to collect and organize content. AICC. An E-learning standard which uses the HTTP AICC Communication Protocol to permit the exchange between course content and the LMS. xAPI/TIN CAN: The xAPI (formerly Tin Can API) API is an E-learning software specification. This type of software allows learning content and learning systems to speak to each other in a manner that records all types of learning experiences. Learning experiences are recorded in a Learning Record Store, or LRS. LRS’s can exist within traditional Learning Management Systems, or on their own. Click here to learn more! Video. Upload your videos to make the learning process faster and more engaging. File. Upload files (documents, etc) that users can download. Assignment. Assignments are activities that instructors ask learners to complete by uploading a file or linking a video. The instructors will then be able to evaluate these videos or files. Elucidat. Available only if you have activated the Elucidat App. Allows you to embed an Elucidat product in an E-learning course. Central Repository. Available for those using Docebo 6.9 or higher. Add training materials that are saved in the CLOR. Slides Converter. Allows users to convert files from PDF, ODP, PPT, or PPTX formats into a sequence of snapshots that can be used directly in the platform without being downloaded locally on a user’s computer. HTML Page. Add text, table, and images, or embed videos from external websites. Survey. A useful tool to collect user feedback. Test. A built-in evaluation tool.